Kayaking and alpine hiking are two outdoor activities that are difficult to undertake in the same day. Kayakers tend to stay in river valleys, while alpine hikers are intent on getting above tree line. Retired engineer Chuck Corwin may bring these two activities together. He spent 10 years creating what may be the world's lightest foldable kayak. It's designed to be paddled at the highest and remotest of alpine lakes. "I designed it with backpackers in mind," said Corwin, who served as Blaine County administrator for nine years before pursuing a lifelong dream. Corwin grew up on the shore of Lake Michigan, working for two summers at a boatyard before joining the Air Force. He served as a navigator for the RF-4 jet and later as a civil engineer. "I always wanted to design a boat," he said. About 10 years ago, Corwin began exploring boat design with the dream of building a kayak that could be carried in a backpack. He bought naval architecture computer hardware, did a little research and went to work at his East Fork home on what would eventually be one of the lightest, if not the lightest, foldable boats in the world. Messing About in Boats magazine featured Corwin's creation in May 2009 in an article titled "A Boat Named Alice." The story was written by Corwin and provides a detailed account of the trials and tribulations of bringing his vision to fruition. The finished product is made of carbon fiber tubing, five wooden bulkheads and a skin made of Hypalon, the same material used in the construction of lightweight airplane wings. There are many other foldable "skin-on-frame" kayaks on the market these days. In fact, they have been made for thousands of years, from the Eskimo kayaks of the Arctic to the water-buffalo-skin coracle rafts used in tropical regions. But unlike what has come before, Corwin's 12-foot kayak weighs only 10 pounds. It can be packed into a backpack, along with paddle, personal flotation device, a few accessories and lunch, and taken just about anywhere a person is willing to hike. "I have been researching this for years and I don't know of any that are lighter," Corwin said. Alice, which is the kayak's official name, is derived from Alice Lake, a pristine mountain lake at the end of a challenging hike west of Pettit Lake in the Sawtooth Mountains north of Ketchum. The spectacular hike to Alice Lake includes six stream crossings, only one of which involves a bridge. After gaining 1,600 feet in elevation, most people who visit Alice Lake are content to rest and feast their eyes on the rocky alpine scenery. Corwin also spends about 30 minutes assembling his kayak and then paddles out. "It's really magical to be out on the water up there," he said. Corwin last modified his design only two months ago, making changes that he said will reduce assembly time in the field. He offers a roll of "actual-size" plans for sale for $100, complete with detailed instructions for building the parts. Corwin said the materials needed to build the kayak cost about $850. He said it takes about 300 hours to cut and assemble the parts for an Alice kayak. 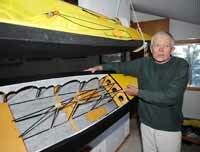 So far, Corwin has built four of the kayaks himself and sold as many designs through magazine articles. "I like designing stuff," he said. "My hope is that more people will build them."